Pressbooks allows you to add interactive elements to your book, which are referred to collectively as “media.” Pressbooks enables you to include three types of media in your book: images, audio and video. All media file uploads must be under 10 MB, but we recommend keeping them under 2 MB. There are two ways to upload images files: 1) from the left-side dashboard menu, you can access your media library and add or delete files or 2) as you’re writing, you can insert media in a chapter, front matter, back matter or part. Click Add New either in the left menu or at the top of the main panel. A screen will appear where you can upload your images. You can drag files from your computer onto this screen. Or, click on Select Files to browse for the correct media files on your computer. Click on the file names and the files will upload. To edit files you have uploaded, click on Media Library. Hover over a file to see the options, then click Edit. Go to the post in which you would like to add an image. Put your cursor where you would like the image to appear. The Insert Media screen will appear. An interface will appear with the option to drag and drop or select files. You can also find and select a file that you have already uploaded previously by clicking on Media Library. When you are uploading media from within a post, you can also click on Insert from URL to pull in a link to a photo on the Internet. This image will not be added to your media library. Once you’ve uploaded your image and inserted it where you want it, for best results, you’ll want to give it some styling. Once your image uploads, click on it. The Attachment Details menu will appear to the right. Critical: Give your photo a caption. Photos without captions will not render properly in all e-readers. It’s best practice to write Alt Text, which will be read to visually impaired readers by a screen reader or accessibility device. Add a Title and Description for your image here. Select the preferred alignment for your image. Have your image link to itself, or somewhere offsite. You can edit your images in Pressbooks. More on that in the next chapter, Image Editing. We get a lot of questions about how to prepare images for upload into Pressbooks. Those questions are answered in this blog post. Prefer to watch and learn? Here’s a brief visual intro to adding images in Pressbooks. When uploading media from within a post, you also have the option to create a gallery. This allows for several images to be inserted into a post simultaneously, and to be formatted together. For best results, you’ll want to utilize best practices when working with images for your ebook and print book outputs. Refer to this article on using images in Pressbooks for important tips and tricks. The file should then appear in your media library. NOTE: If an image is already in your media library, you can access the image and its URL by clicking Add Media at the top of a chapter. Your image will appear in your Visual Editor. This will open up the Image Details window. Your image will appear as a thumbnail in your webbook, but open as a larger image once clicked. 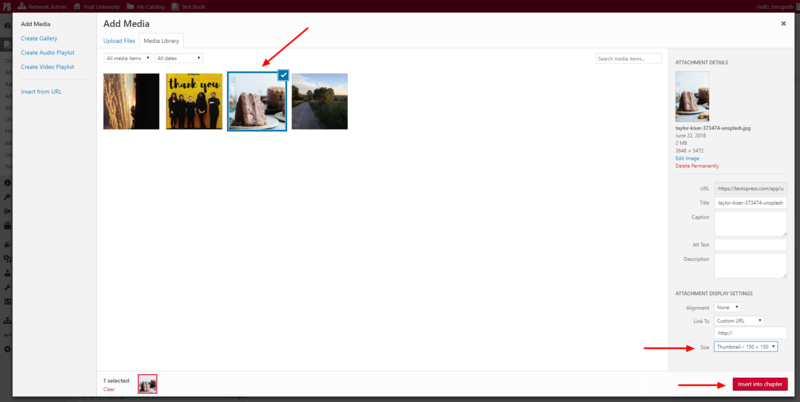 Go here to read about enabling Lightbox for images in your webbook. Media: Images & Best Practices by admin is licensed under a Creative Commons Attribution 4.0 International License, except where otherwise noted.